The Selinsky Companies is a leading provider of specialty rigging, crane services, heavy machinery and equipment transportation, steel erection services, and various equipment rentals to manufacturers, electric utility and construction companies. Along with its rental equipment, the Company promotes the majority of its services to the industrial, manufacturing, utility, and construction industries. 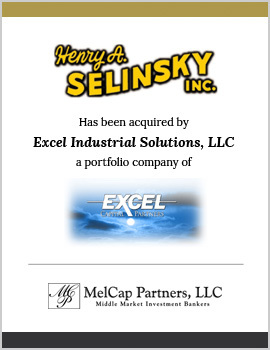 MelCap acted as the sell-side advisor to The Selinsky Companies. The Company was sold to Excel Industrial Solutions, LLC, a portfolio company of Excel Capital Partners, LP, a private equity group.